..:: R E T I R E D ::..
Lad is a very well bred tri-saddle-sable, tip eared, male. He has over 5 champions in his pedigree! Including but not limited to: *##Imp. Nan ABC 77943, #Mirk ISDS 96612, ## Imp. Craig ABC 142668, ##Spot ISDS 161819, ##Zac ISDS 66166, and 2005 working dog of the year @@Imp. Dale ABC 50469. He is truly a great all around dog. He is a great companion and is very affectionate, but at the same time he is very tough on stock. 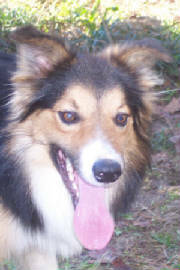 We are very pleased with Lad as he is a quick learner and excellent herder! I like him a lot; he has it all! 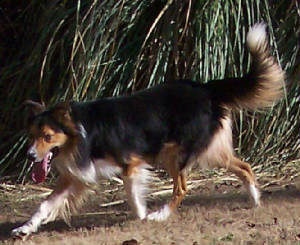 Looks, Smarts, Herding ability, personality, intensity, and love to share! This picture shows Lad's lovely tri mask! Where did we get Lad?? We purchased Lad from Bonderosa Border Collies, in Hillsville, VA. Amanda Bond, the owner, was very nice and we met in Abingdon, VA.